Sleep is an important part of your health. Without enough sleep, you’ll start to feel it both physically and emotionally. If you’ve been having a hard time getting to sleep at night, perhaps it has less to do with the stress of the day and more to do with your bedroom. When you’re trying to sleep in uncomfortable conditions, you’ll find that you toss and turn half the night. To get that deep rest you need, it may be time for you to redo your bedroom. If you don’t have the funds for it right now, these budget-friendly solutions should be a real help. If you don’t have any money in your own budget, you can always take out a loan to have your bedroom redone. You don’t have to jump through the many hoops a traditional bank would have you to do, instead you can opt for consumer installment loans. They can be applied for online and if approved, you’d receive several hundred dollars deposited into your account. Such installment loans are ideal for those with no collateral, no credit, or bad credit. You can then add the monthly payments to your budget and pay off the cost of remodeling your room over time. If you’re tired of the plain white walls in your room you can change them for just a few bucks. A gallon of paint doesn’t cost too much. Though your room is your personal space, you do ideally want to choose a color that promotes relaxation, peace, and tranquility. Going with shades of blue or green, for instance, is a great idea. They give off a feeling of calm which can make getting to sleep a lot easier. Lighting can really impact your ability to sleep. If your room has a lot of windows, getting to sleep during the day or during seasons where the sun stays up a lot longer can present a challenge. The light flashing on your eyelids sends signals to the body that you’re ready to get up. You can change all of this by purchasing new window treatments. Dark blinds, shades, or darkening curtains can allow you to control the amount of light is in the room during the day and at night when you’re trying to rest. Believe it or not, a cluttered room can keep you up at night. Your mind starts focusing in on all the junk around you making it a bit hard to get some shuteye. You can help resolve this matter for free (and perhaps earn some cash in the process). Clear the clutter from your room. 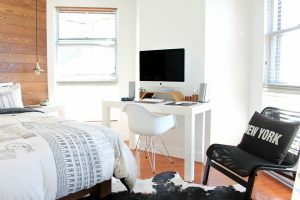 Anything you no longer have use for, you should sell it online or at a yard sale to earn some extra cash that can be used to add to the new bedroom makeover. You can place other things in storage to free up more room if necessary. Though you want to stick to a small budget, if your bed is more than ten years old, you need a new one if you’re going to get any sleep. Of all the things you buy for your room, your bed is worth spending a bit more on. You can opt for a platform bed mattress or newer mattresses that adjust to your movements, comfort level, and desired temperature. Since you’ll have the bed for awhile, make sure it is to your liking. Go test a few out to see which best suits you. The last thing you need to do to complete your bedroom makeover is to accessorize. Now that the room is clutter-free, you can add some decor to personalize the space. Though it may not be something that helps you get to sleep, it does make the room feel more inviting which always adds to comfort. You can buy pillow shams, add a throw blanket to a chair, hang up paintings, or even invest in candles, tabletop water fountains, or aromatherapy devices to enhance your relaxation at night. You need your rest, but it’s not always easy to get it. If you’ve been tossing and turning for the past few days with no such luck, you really need to address the matter. If you’ve already ruled out things like medical problems or an increased amount of stress, then perhaps you simply need to make a more comfortable bedroom to sleep in. The above ideas will help you to make your room look amazing without going broke.